Hi friend! Today I thought I’d get back into some important information sharing. My hope is that if you’ve been around the blog for a little while, you know the power that food has to create or heal dis-ease in the body. This article will look at the specific links between certain foods and the development or progression of Type 2 Diabetes. Open a newspaper and it won’t take long before you see that this disease is reaching epidemic levels and unfortunately the Standard North American Diet, with it’s focus on processed foods, chemical preservatives, inflammatory fats, and ALL THE REFINED CARBS supports the creation of this disease. Keep reading to learn about some dietary interventions you can start incorporating today to feel better and manage your sugars more naturally. Trying to make sense of all the conflicting nutritional information on how to manage insulin resistance can feel like a second full-time job. Eat more whole grains, go low fat, and use artificial sweeteners are some of the most common recommendations you’ll find once you’re diagnosed. If, however, you find that this diet isn’t giving you the results you were hoping for, then this article is for you. 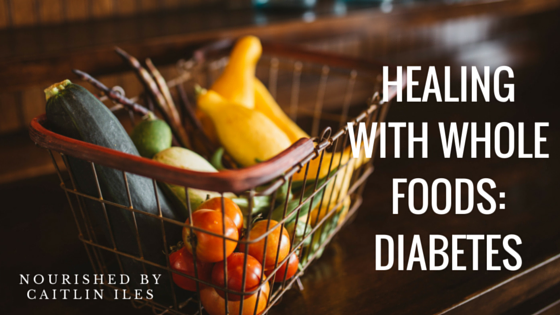 One of the best things that you can do to manage your blood sugar balance is to avoid processed foods and focus on whole, nutrient-rich foods. Processed foods can typically be spotted because they are the ones that will have ingredient listings and sport health claims on their packaging. These foods have often been so refined and stripped of nutrients, such as blood-sugar stabilizing fibre and vitamins that are used for metabolism, that they are essentially pure sugar with a few preservatives and synthetic vitamins thrown in for good measure. In large amounts, sugar and refined carbohydrates are toxic to the body and promote a state of inflammation and excessive insulin production. If you regularly continue eating refined foods it can lead to a state of insulin resistance as your body loses her ability to use and store excess sugar in the blood stream. At any given time you should only have 1 tsp. of sugar in your blood to remain within healthy levels. If you think about the fact that most processed foods contain upwards of 5 to 10 tsp. per serving, you can see why you’re getting in trouble. When your body senses that you have more than 1 tsp. of sugar in the blood, she reacts quickly by producing insulin to shuttle it into cells for energy or to be stored as fat because more than 1 tsp. of sugar is toxic to your cells. After processed foods another important step in maintaining healthy insulin levels is to avoid simple sugars such as table sugar, high fructose corn syrup, brown sugar, corn syrup, agave nectar, honey, and maple syrup. These simple sugars are quickly absorbed by the body and cause spikes in insulin production that over the long term can lead to resistance in our cells, especially when combined with a diet high in processed foods. Now once you have gotten your blood sugar stabilized and begin focusing on a diet rich in whole foods, you can likely start reintroducing small amounts of honey or maple back into the diet. The foods you eat that cause the largest spike in blood sugar and insulin secretion come from various carbohydrate sources. The most well known of which is sugar and other sweeteners, but did you know that grains such as wheat, rye, barley, quinoa, rice, and millet, can have just as much of an impact on your blood sugar levels and insulin resistance? These types of cereal grains and grain-like foods contain a specific type of carbohydrate (amylopectin-a for those of us who want to get sciencey about it) that raises your blood sugar because it is very quickly and easily digested and broken down into simple sugars. In both human and animal studies, foods high in this specific carbohydrate have been shown to cause the development of insulin resistance in 12 weeks or less. In light of this effect on your body, one of the best dietary shifts you can make is to eliminate grains and replace them with more fibrous carbohydrates such as leafy greens, broccoli, cauliflower, Brussels sprouts, and some berries. Limiting the quickly digested carbs from grains and adding in these fibre-filled foods will go a long way towards keeping your blood sugar levels stable so that your insulin levels can regulate. In addition to eliminating processed foods, added sugars, and grains, a great way to help balance your blood sugar is to focus on whole foods, the ones that you find at the grocery store that typically don’t have nutrition labels and come in a form as close to nature as possible. You want to make sure that you’re getting a balance of healthy proteins from ethically raised animal sources, sustainably caught fish and seafood, nuts, and seeds; satiating fats from avocados, healthy animals, butter or ghee, coconut and olive oils; and the right types of carbohydrates in the right amounts, at the right time. You also want to make sure you’re eating a healthy dose of nourishing fats. Though you were likely taught to fear fat in the 90s, recent research has vindicated this macronutrient. Not only will proper sources of fat keep you fuller for longer thereby reducing food cravings, they also help build healthy cells in body and brain, promote an anti-inflammatory state, and help keep your blood sugars stable as they have zero impact on their rise and fall. You can read more about health-promoting fats here, here, and here! Make sure that you avoid fats that promote an inflammatory state in the body when eaten in excess. The most important fats to avoid for lasting health include these vegetable oils: canola, peanut, soy, corn, safflower, sunflower, and cottonseed and any oil that has been hydrogenated or partially hydrogenated. They have no place in a healthy diet and can actually cause more harm to cells that are already overwhelmed by insulin resistance. As a side note none of these oils actually come from vegetables, but are chemically extracted from seeds and go through a 7-step process to get them from plant to giant plastic container. Eating a diet outlined above that is rich in proteins from animals, seafood, nuts, and seeds; healthy, anti-inflammatory oils; and fibre-filled carbohydrates has been shown to improve glycemic control and markers of cardiovascular disease in diabetics. So if you’re tired of struggling with dietary advice that isn’t working for your body, try testing out this grain-free diet to see how it impacts your blood sugar control. Well that’s all for today friend. If you’re really looking to super charge your health, start adding fermented foods to your diet! You can download my FREE Fantastic Fermentables E-Book by clicking here.